After a rather dry and mild period in the Alps, the snow is back and the future is looking snowy! The ski deals for next season are out now. Spring is in the air, the snowdrops are everywhere and the ski deals for 2019/2020 are out. There has been plenty of fresh snow falling across the Alps this past week. This is great news as the pistes are in perfect condition and off piste is offering plenty of powdery adventures. As temperatures drop across the UK today they are also dropping across the Alps. The Autumn air is turning frosty and snow is forecast which is great news. Well the end of the ski season is finally upon us. Many resorts close up this weekend with the rest following over the next week or so. The huge amount of snow that fell over the season this year and lowered temperatures this week will ensure that the skiing is fab right the way through to the season's end. If you have already booked or been skiing this year and are thinking about your next ski holiday then now is the time to book! we wish you a happy and snowy Christmas. The conditions are wonderful out in the Alps just now so it is a fabulous start to the ski season. It really will be the best start to the season in years as there has been so much snow! The Alps are looking lovely this week as there has been plenty of fresh snow which is great news for the start of the season. We are able to offer short breaks to catered chalets in Meribel and Alpe D'Huez from just £229. These prices include flights, transfers and chalet board. It is snowing up high in the Alps today proving that Winter is on the way. As we ease ourselves into September we can start to look forward to cold crisp nights and fresh snow in the Alps. Come and ski Colorado and not only ski some of the best mountains in the world but take advantage of some of the best ski deals. Where to ski pre Christmas? If you are desperate to get back skiing as soon as you can then we can help. Head to one of the guaranteed early skiing resorts and you will be skiing at the end of November/early December. 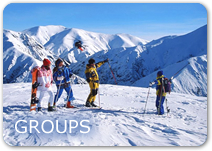 Are you booking a group ski holiday? At the end of the season everyone loves to party. The apres ski begins early on the sunny decks with great music and shots galore in most of the ski resorts. It is the 1st March and Spring is in the air. The sun is shining, there is snow on the hills and the daffodils are starting to appear. Amazing Skiing in North America! The heavy snow of last week is now fading to light snow showers. The sunshine is due to come out mid week providing amazing ski conditions for skiers and boarders across the Alps. Did you make a New Year's resolution with a dram at the bells on hogmanay? How about get fit for skiing or book the ski trip of a lifetime? There has been some fresh snow across the Alps which is more than welcome. This has freshened up the pistes for the guests arriving for their Christmas holidays. Conditions are looking amazing in Jackson Hole. This is the time to ski a real cowboy resort with huge amounts powder on and off piste. The snow is so good that some of the resorts such as Courchevel and Alpe D'Huez are going to open early! The first big snowfalls are falling across the Alps. It is looking fantastic out in Europe with plenty of snow falling to give a good base to the start of the season. The resort of Tignes opened it's doors to skiers and boarders for the 2016/2017 at the weekend! The first of the European resorts to get going and it is looking good. If you are planning a ski holiday across in Colorado and perhaps an early and end of season break in the Alps then the EPIC lift pass is what you need. What a week it has been with the Brexit and politicians falling by the wayside all over the place including the PM resigning! There has been more fresh snow across the Alps this week topping up what are already fantastic pistes. The forecast is for heavy snow across the Alps today with more over the weekend which will be a welcome boost after the rain earlier on in the week. After a pretty poor start to the ski season the snow has been dumping down and there is plenty of the white fluffy stuff for everyone! At last the season is here. After the countdown through the Summer months the snow has finally come and the lifts are up and running. The all inclusive ski deals are back! Head along to the Olympic Park in London this November to Freeze Big Air 2015. You will see the world's best skiers and snowboarders competing in the FIS big air World Cup. The Eurostar seats are now for sale so you can book your seats for your next ski holiday. We have launched a brand new spanking website that is dedicated to Meribel and all things Meribel. The major resorts are closing their doors this week as the season draws to a close. Even more snow in the Alps! A plane that was trying to take off from the airport in Avoriaz came into difficulties and had to land on the piste. There has been plenty of fresh snow falling across the Alps over the past couple of days. The Portes du Soleil had 20cm and Chamonix saw 30cm and there is more still to come! Millie Knight who is a 16 year old disabled skier has won the World Cup GS title for 2015. Winter is back with a vengeance in the Alps which is great news as we head into February. Sterling has hit a seven year high against the Euro. £1 will get you 1.33 Euros this morning which is fantastic compared to the exchange rates of recent years. The fresh snow that has been falling over the last few days has given some wonderful powder conditions. Finally we have had a decent fall of snow across the Alps! The freezing level is due to drop and more snow is forecast into the weekend which is fantastic news. Dave Ryding claimed 2nd and 4th places in the Europa Cup Slalom races in Chamonix which is fantastic! Bond is back on skis in the new movie! It's official that James Bond will be back on skis again in the new Bond movie Spectre. The Norwegian City of Oslo has announced its withdrawl from the bidding process for the 2022 Winter Olympics after dwindling public support. The old very slow Altiport chair lift to Courchevel is finally being replaced by a new fast one for this coming season. It will take 7 Minutes to get to the top! Verbier ski area sticks together! Verbier and the other resorts of the largest ski area in Switzerland have reached an 11th hour agreement to stay together for next winter. The largest ski area in Switzerland has split down the middle after the various lift companies fight over revenue share. Tickets for the service to France have gone on sale. It travels direct to the heart of the French Alps giving access to many of the major resorts. Free lift pass Offers ending soon! Some of the holiday operators are giving away free lift passes on selected dates in many areas such as the Three Valleys and the Espace Killy - this offer ends on the 31st July! Many dates are selling out fast and we don't want you to miss out on your ideal holiday or accommodation. Verbier ski area breaks up! Verbier has announced the 4 Vallees ski area is breaking up after the various lift companies could not reach agreement. There will be fewer catered chalets available in the Swiss resorts next year such as Verbier and Zermatt as operators are having to conform to Swiss employment and wage laws. This years Winter Olympics in Sochi has sparked a marked interest in holiday bookings for next season. There has been more fresh snow in Europe and heavy snow in parts of North America. The Sochi Olympics are underway following the Opening Ceremony which was watched by 40,000 people in the stadium and millions on the TV. There has been some big snowfalls over the last few days in many parts of the Alps. Up to 70 cm's of snow has fallen over many parts of the Alps over the weekend resulting in skiers and boarders enjoying some great Autumn conditions. France the most popular ski destination in the world! France is the most popular with 57.9 million skier visits, with the USA second (56.9 million visits) and Austria third (54.2 million visits). The French Ski school has been in the UK to try and improve their relations with the UK tour operators following the court case in France which resulting in ski hosting being banned/suspended. The UK's largest ski tour operator has moved some of it's ski school business to alternative company following the court case earlier in the year regarding ski hosting. The Birmingham Ski & Snowboard Show, that was to have taken place at the National Exhibition Centre has been cancelled. A tandem paraglider managed to get caught on the main cable for the Brevent telepherique lift in Chamonix on Sunday, fortunately neither the pilot or passenger were hurt in the incident. A new law in France requires restaurants to specify on the menu what is 'homemade', when the dish is produced from raw ingredients on site. Rail fares to the French and Swiss Alps go are now on sale. Return prices are from £179 per person. Skiing continues after fresh snowfalls! Up to 1 metre of snow fell last weekend extending the season in some resorts which are still open. Conditions are spring like but the fantastic season goes on and on! Fantastic late season snow conditions! Snow fall in North America, sunshine in Europe! After a bit of a disappointing season so far there has been some good snowfall in North America. Around half metre has fallen in some resorts - and Whistler has had up to 1 metre. The law which was supposed to be introduced this month in France which would have meant having to carry a breathalyser kit in your car has now been scrapped. A number of major ski companies met to discuss the way forward after a French court ruled ski hosting was illegal. An appeal by Le Ski has been lodged. It is not too late to get away for the February half term and there are some great last minute offers and bargains available. The popular British rock band Deep Purple will play out Ischgl's ski season at the annual Top of the Mountain closing concert, this year on Tuesday, April 30. A French law requiring all drivers to carry a breathalyser kit in their car comes in to force in March. The organisers of the London Ski Show are also putting on a show in Manchester this year. It will be on the same dates as a new show in Birmingham that has already announced. In France about 40 cm's of snow has fallen with another big storm hitting the Alps - and there is fresh snow in Switzerland, Italy and Asutria. Snow, Snow & more Snow!! The snow just keeps on falling - after massive dumps in the Northern Alps it is now the turn of Austria and the eastern Alps. Snow arrives in the Alps! Snow falling in the Alps! More resorts open & Snow on the way! After the snow earlier in the month the temperatures have been quite mild over the last week but the weather is forecast to change with good snowfalls expected from Tuesday. More Snow and more resorts opening! An insurance company - Essential Travel - has made the wearing of helmets on the ski slopes a requirement within the terms of its winter sports Insurance policy. A fewl of glacier ski areas open this weekend with more to follow soon. The heavy snow from earlier in the week has helped though temperatures have increased and much has melted. Émile Allais who set up Ecole de Ski Francais has died aged 100. He helped create modern ski resorts and is considered the first great French ski racer dominating the sport in the 1930s. Rules and regulations are being tightened for piste bashers after 3 people were killed in Austria last year and 2 people badly injured after accidents involving piste grooming machines. Norwegian snow stored from last Winter! The Norwegian resort of Trysil has stored snow under wood chips over the summer months and has just brought it out so people could go skiing. There has been some fresh snow in a number of Alpine resorts such as Saas Fee which reported 45 cm's of the white stuff and Zermatt were also reporting new snowfall. Val Thorens has spent another €4.3m on the Péclet Funitel, installing new automatic functions in the Funitel stations, as well as new and more spacious cabins. Europe's summer ski areas have had a wintry flavour the last few days. Snow below 2000m in many mountain ranges has put an end to a rather prolonged warm, dry spell. A comfortable new six-seater chairlift at Les Menuires will replace the old Reberty bucket lift this winter. Precautions are being taken by ski resorts in California, Colorado, Utah and many other states as the most severe fires in a decade sweep across several mountain regions. French resorts are gearing up for Summer skiing. The new lift will replace a lift that was installed over 50 years ago and will double the number of people that can be taken per hour. Up to a metre of snow has fallen and resorts are opening early in New Zealand and resorts in Australia are opening as well. St Anton restrains apres ski! The Austrian of St Anton which has a reputation for lively après ski is attempting to stop people drinking in their ski gear after 8 pm in the evenings. A new 10 seater gondola lift will open in Meribel in December. Jet2.com has announced the launch of a brand new route from Manchester to the French city of Grenoble. Scotland has been experiencing some of the best conditions of the Winter over the last few days. Alpine season ends with a bang as more snow falls! Heavy snow in the Alps! It's been snowing again in many Alpine resorts giving fantastic late season conditions for April skiers! A week ago at The Lecht it was +23 C but now some lifts are running after closing for the season. Cairngorm also has a small amount of skiing available after the fresh snow. Winter has returned to the Alps and slopes are being refreshed with between 10-30 cm's of new snow. After a long spell of warm weather this a welcome top-up to the pistes. Whistler reports 170 cm's of snow in the last week! The Canadian resort of Whistler has reported 170 cm's of snow over the last week with 30 cm's falling in the last day - and another 30 cm's forecast in the next day or so! The best riders in the world are in Tignes this week for the 3rd Winter X Games. Kelly Clarke has won the women superpipe and Shaun White appears for the first time. Mariah Carey will be closing the Ischgl concert at the end of April. After weeks of freezing temperatures in the Alps it has warmed up recently. There has been fresh snow in North America with almost a metre of snow falling in Steamboat! Dutch prince Johan Friso is in a stable but critical condition in hospital after being buried for 15 minutes in an avalanche today. Wrap up warm in the Alps!! It has been bitterly cold in the Alps over recent days with freezing temperatures set to continue for some time. It has been around -20 C in many resorts in Europe. After massive snowfalls in December and January it has been calmer in the Alps recently but this is due to change as big falls are forecast over the weekend. Vail and Beaver Creek have received about 40 cm's of fresh snow and Breckenridge about 30 cm's and Keystone about 15 cm's. Zermatt was cut off from the yesterday as the avalanche danger closed the rail and road links to the resort and heavy snow prevented helicopter flights. Helvetic airways is running a service from Bristol to Zurich this winter. The service starts at the beginning of December and all skis and snowboards go free! It's been snowing in some parts of the Alps. British Snow Tour organisers have revealed a new era of Indoor Championships – The Rebellion. New Zealand is seeing one of it's most severe storms for about 50 years - great for skiers but maybe not for the locals. It came as no surprise that South Korea won as it was always the favourite against Annecy in France and the German City of Munich. The announcement was made in Durban. Glacier ski resorts of Val d'Isere, Tignes and Les Deux Alpes will begin to open for Summer skiing this weekend (11th June). The Killers are to join many other acts at the Ischgl season closing party on the 30th April. Fresh snow fell recently in Colorado, in Loveland and Arapahoe Basin - the two ski areas currently racing to be the first without glaciers to open for the 2010/11 season. There has been some decent Autumn snowfalls in Western Canada and also across the central and Eastern Alps - as well as in Sweden. Resorts in New South Wales have reported around 65 cm's of fresh snow in the last few days. Thredbo received about 70 cm's with nearby Perisher doing nearly as well. Firpark Ski Centre in Tillicoultry, Scotland was attacked by vandals recently. Tignes and Val d'Isere in the Espace Killy have received fresh snowfalls just before the resorts open for their Summer skiing season. Amy Williams won gold in the Vancouver Winter olympics - the first individual medal for a British competitor for 30 years.